The Final Countdown is a 1980 alternate history science fiction film about a modern aircraft carrier that travels through time to the day before the 1941 attack on Pearl Harbor. Produced by Peter Vincent Douglas and directed by Don Taylor, the film stars Kirk Douglas, Martin Sheen, James Farentino, Katharine Ross and Charles Durning. This was Taylor's final film. Last edited by jfko6 on Wed Mar 07, 2018 10:06 pm, edited 3 times in total. this is one of the films i like to see again and again. in german the title is: "der letzte countdown"
we are generaly surprised when we find a very old ration, this lady is surprised by the inspection date of a VERY new 1979 MCI! The Final Countdown movie poster from 1980. This is an original copy of the screenplay for the movie The Final Countdown. The book varies in details and portions of the time travel sequence was not transferred to film. This is another sci-fi time travel movie I enjoyed. It may not be suited to every audience. The movie aged a bit but the HG Wells book stands the test of time. This version of the HG Wells classic will have its advocates and naysayers. the U.S.S Nimitz when they are hurled back to December 6, 1941.
with analysis of the book which is the actual screenplay for the movie. Review can be found on Lockergnome through the following link. 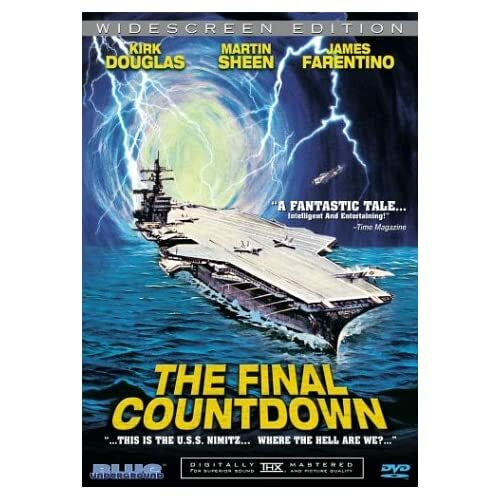 The Final Countdown is a 1980 alternate history science fiction film about a modern aircraft carrier that travels through time to a day before the 1941 attack on Pearl Harbor. Produced by Peter Vincent Douglas and directed by Don Taylor, the film stars Kirk Douglas, Martin Sheen, James Farentino, Katharine Ross and Charles Durning. This was Taylor's final film.